Production of Cassava Starch and Gari - Haba Naija! Starch is a common food in Edo and Delta states while Gari is common in the whole of southern Nigeria. The production of the two food items is the same up to a stage. Step 1 Harvest the cassava from farm and carry to the processing shed as soon as possible. Step 2 peel the cassava and wash in clean water. Step 3 Grind then cassava with grater. If starch is to be extracted from the gari the grinded cassava should be poured into a basin of clean water and stirred together. After this filter with fine cloth .Allow the filtrate to settle then drain the water on top away. The sediment at the bottom is cassava starch. The residue collected on the filter is further processed into gari but it produces low starch gari and considered inferior in the market. The irony is that not many consumers can identify or differentiate between this gari and the superior one. For gari production the grated gari is poured into sac for pressing. Pressing is usually done with screw press or hydraulic jack press. This is to reduce the water in the gari and make frying easier. It should not be too dry at the press because some moisture level is required for the frying. Step 4 Sieve the gari. Step 5 fry the gari with fervent heat to dryness. The gari is now ready for the market. 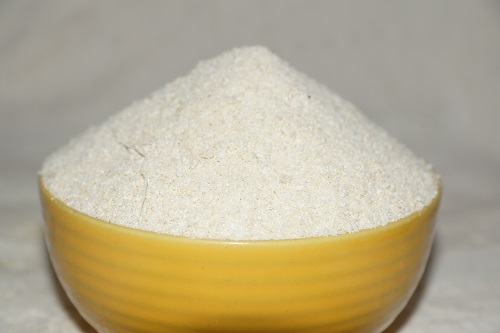 The common unit of gari bag is the Golden penny bag of flour. We are expected to produce at least 22 bags of this bags from the standard 3 tons truck of cassava. A bag of gari now cost 4700 Naira at Ifo market. Cost analysis Price of cassava 60000 Naira. Cost of peeling 3000 Naira Cost of sieving 1000 Naira Cost of frying 4000 Naira . Miscellaneous expenses 2000 Naira Total is 70000 Naira. Tentative sales are 103400 Naira. It is noteworthy that majority of the producers in the west have diverted to either elubo or fufu because of the price and the stress involved in frying. Ifo was the major producer of gari in those days but now 85 % of the producers have diverted to fufu. They are now the major supplier of fufu to Lagos.